Ever wonder how they make these simple beautiful pieces? In this class, you can make your own CZ pendants. 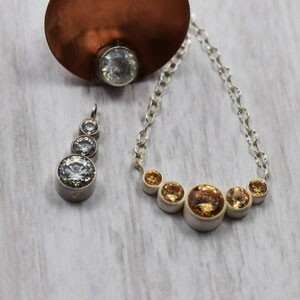 We will show you how to solder these gorgeous pieces step by step. Learn heat control, setting cz in pre-made settings, and best tools for the job. Use up to 10 settings, and cz’s to create your design. We will be using sterling silver for our projects. Chain is included at additional cost. Need to have taken one soldering class before taking this class.